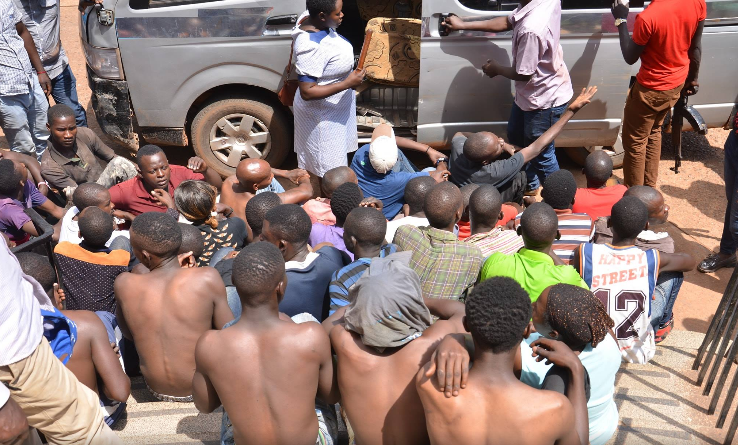 KAMPALA– Police in Kampala has about fifty-four (54) suspects arrested over impersonation as telecommunication workers and fraudster of lucky draws winners. Two of the suspects are women. The Kampala Metropolitan Spokesperson, Luke Owoyesigyire says the suspects send congratulatory messages to peoples’ phones, telling them how they have won money and other prizes and that the recipients of the text message are immediately requested to call a certain phone number to redeem their prizes. “These fraudsters purporting to be working with certain telecommunication networks ask message recipients to confirm with the pin number and scratch a credit card for them to begin the processing of his prize,” revealed Owoyesigyire. Following various telecom company reports about the escalating complaints received from their customers, police enhanced a search onto suspects by tracking their phones. According to police reports, most of the arrested suspects are from Salama Road and Busabala where most of these anonymous conning calls originate. Owoyesigyire said that some of the suspects confessed upon police interrogation. On several occasions, the fraudsters send fake mobile money messages, calls requesting one to send money back to their (fraudsters) phones claiming that it was a mistaken deposit and the unsuspecting users end up losing huge sums of money. The suspects will be arraigned before courts of law on charges of obtaining money by false pretense.